Beading as a way of life. Dragons. Beast of fantasy and fire. They have been central to popular fiction in novels, film and more recently, television (OMG...Game of Thrones!!!) and lets not forget mythology! 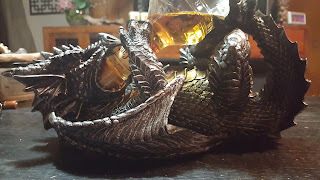 I have been fascinated by dragons since I read The Hobbit as a child. 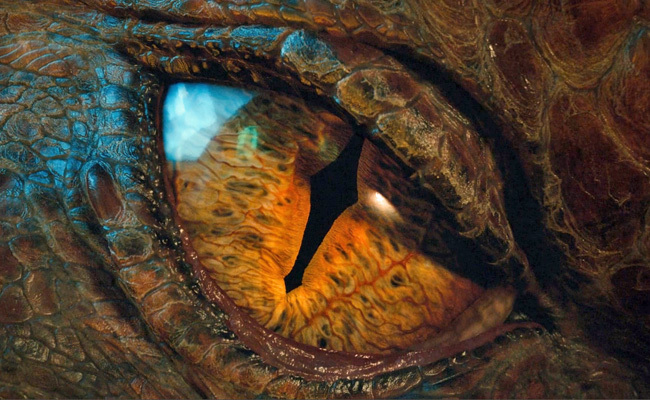 Smaug, in all his sinister glory, is fantastic character. 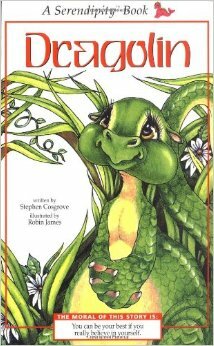 And who could forget Dragolin? Our fascination doesn't stop there...now we have everything from How to Train a Dragon, Eragon all the way to the upcoming Pete the Magic Dragon. I was even given an AWESOME dragon bottle holder for Christmas! For the month of December Art Elements blog challenged its members and readers to create a piece inspired by dragons. 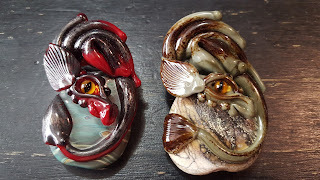 Initially I had intended to use one of my 2 phenomenal dragon beads by Mary Lockwood, however, that is going to take me some serious time to create the perfect beady environment for them. So, I opted to use one of my reptile-esque cabs by Jo Hoffacker. 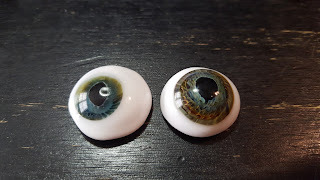 I did not get before pics, of course, but I have a couple other cabs of hers so I have posted a picture of them below. The first thing was to bezel the cab. I opted for a double bezel – an inner white bezel and an outer green bezel. I actually haven't done this before either. One thing to note - for whatever reason I could not tighten the thread enough at the rim on the outer bezel. I am not sure if this is because I ended with a jagged edge or not. More experimenting is needed here. I played around with the idea of using jewel beetle wings for the scales, however, to get the look I would have wanted with those I would have ended up with one honkin’ big pin. Big, in my book, is never an issue...UNLESS your lapel just won't hold it all up! I opted to go with some long magnatamas instead. 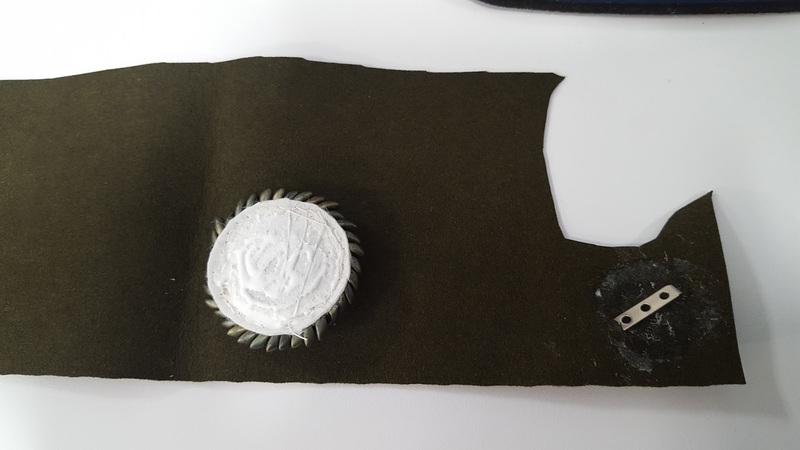 While attaching the backing I nearly screwed completely up – I forgot to cut the holes and attach the pin! Thankfully, I remembered in time to rescue it and get the pin back on appropriately. Panic averted! Unfortunately, I did end up getting a little bit of the glue onto the outside of the ultrasuede but I am hoping I will be able to get that off once it dries a bit. I went ahead and finished the edges and tada! 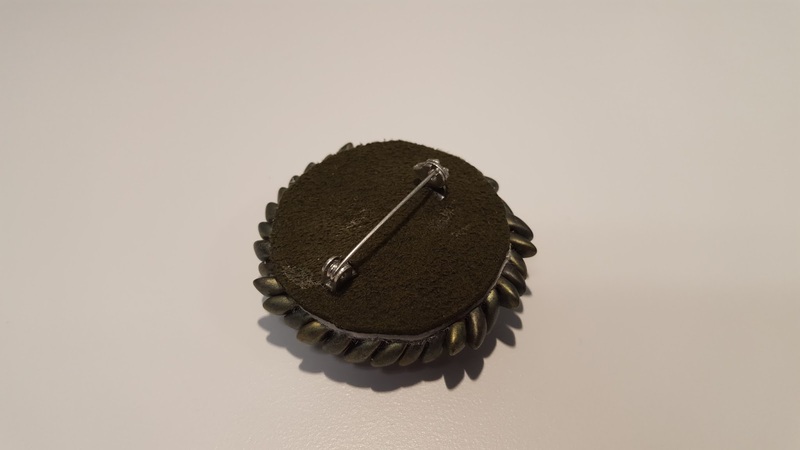 I may end up adding something more to the scale aspect of the piece but for now it will rest on my lapel. I may be a mother of nothing really...but I have a cool dragon eye! #whatwhat! Please don't forget to visit all the other artisan's blogs! Kelly Rodgers <-----you are here! Thanks! I say go for it! It's a part of who you are. I think it celebrates uniqueness and it's just plain fun. Just expect a lot of comments! 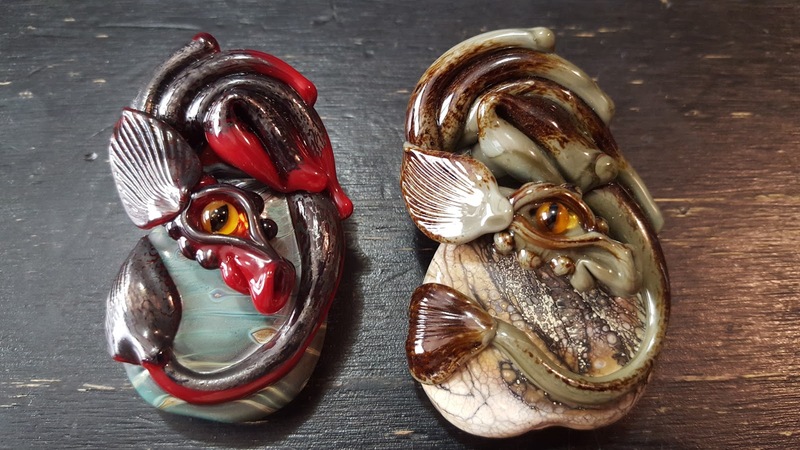 Love your dragon beads and those cabs are stunning! I love what you've done with them! The double bezel idea is very intriguing! I like it. Id wear that on my lapel. Go for it! Well done, and thanks for joining us! That is a great pin. I don't think there's anything weird about wearing eye jewelry. It's long been considered protection from evil in various cultures. But then, I too like to wear "weird" jewelry to my day job. People's reactions are always entertaining. Some give me a look but won't say anything. 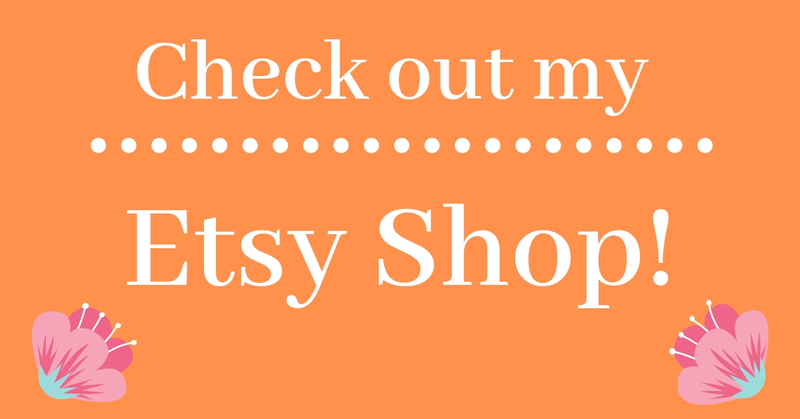 Others ask me about it, which is my chance to shamelessly promote my online jewelry shop. That is the perfect pin to 'freak out the mundanes'! I love it! Love this pin! 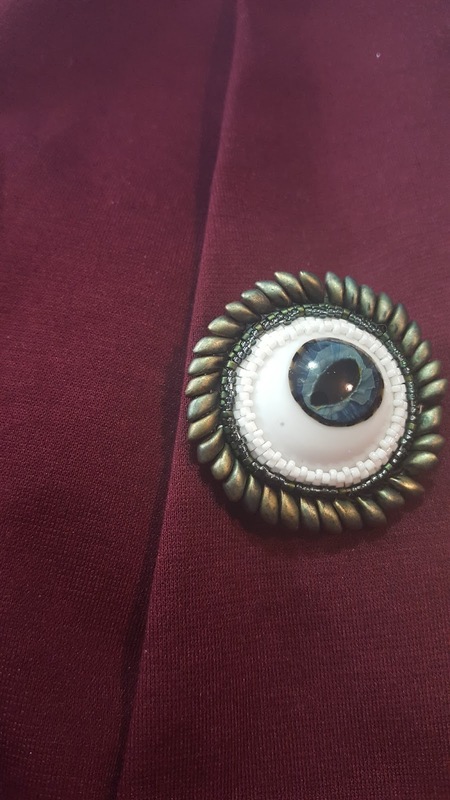 This will surely garner attention on your lapel! Wow Kelly, that's pretty awesome! I have wanted to try the double bezel as well - great job! Love your beads! The double bezel is really cool! 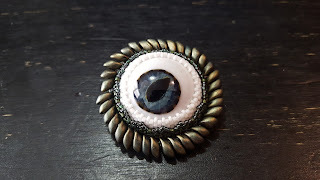 Great job on your dragon eye piece! 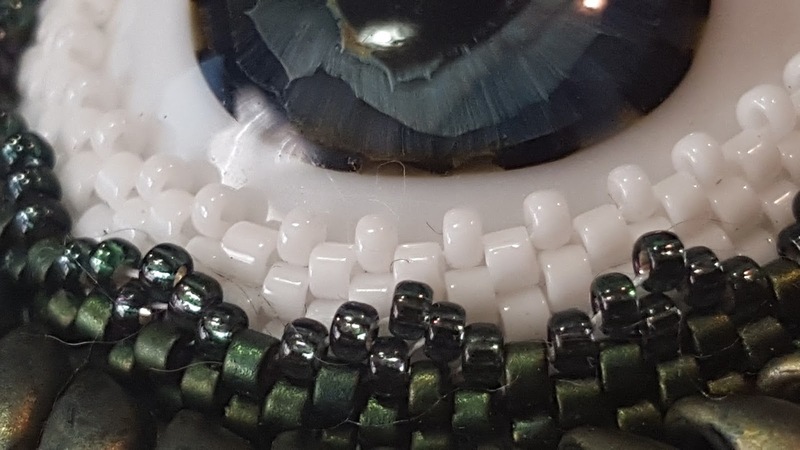 Kelly is a self-taught beadwork artist since 1997. Her inspiration is drawn from nature particularly with oceanic life, cellular structures and oddities. Aside from beadwork she is a co-owner/ co-designer of a one-of-a-kind copper and mixed media jewelry line under the name "Magnolia House" which can be found in several local shops in Northeast TN.